We’re in the process of growing some ourselves (thanks to our dear friend Peter who was kind enough to get a seedling started for us!) But, they’re just not ready yet! WAH! And when a salsa calling hits…man it hits and I want it in and on EV-ER-Y- THING! I was planning on making Taco Stuffed Peppers (from this recipe from Six Sisters…it looked delicious and I’m sure it is along with all of their recipes, I will still need to make it when I’m more prepared). Like, until about two hours ago. I had everything already chopped up and in the food processor ready to hit “GO” so, there was really no turning back. Easiest recipe ever award…right here. Find some chips for snacks or use it in this next recipe (TACO BELL pepper casserole, remember??)! What’s YOUR favorite salsa?! Anything you’d add or take out of this? We’re loving it here! 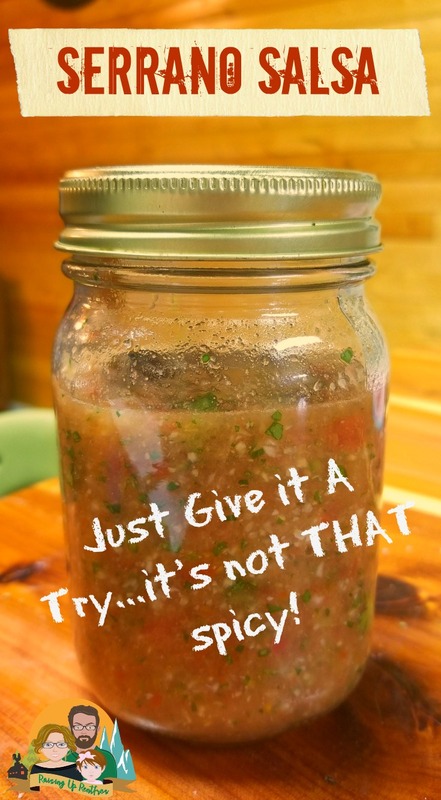 I love that this is a classic salsa recipe, but has a twist with the serrano! It sounds amazing, and I can’t wait to try it. Thanks Inge! It is definitely a classic and going to be a new staple in our household! Let me know if you have any tweaks and I’d love to try your variations too!